Congratulations! You have finally graduated from the worst 18 years of your life- school! Think back of all the times that you have spent learning some things that you need and learning other lessons that you do not seem to really care and enjoy while there are other lessons that have piqued your interest that you would want to learn more, and the rest are just simply forced. But that was school. You can’t really choose what you really want to learn, that’s just how the system works, even in college. You may have the option and liberty to choose what kind of course you would want to get to help you hone your talents and skills, but admit it, you don’t really like all of the lessons that comes with the course. Minor subjects being treated like major ones. We’ve all been there. But the worst is finally over. You may also see checklist examples for students. Now you have absolutely nothing to worry but your reputation and your career standing from here on out that determines whether what you have learned in school has really been applied to your job or did it just exit your mind. However, if there is one thing that stays true is that every person’s first job is special. It may not be your best or most memorable, but it is still special for the very reason that it marks the first step into your transition as an independent adult already capable of making his or her own decisions and deciding what to do with the life he or she owns. And since this will serve as the first job that you have, you might as well learn on how to do it right the first time. 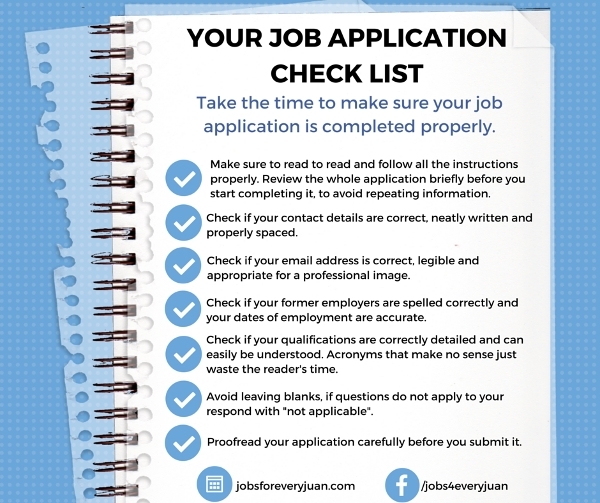 Here are seven steps to help you in your job application process: You may also see last minute job application checklist that can help you prepare for procrastinators. What comes with your resume would always be your application letter. And since it is for an organization, it has to sound formal and polite, otherwise, it might be rude and offensive or simply show how you are not serious in applying for the job in the first place. Talk about why you want to work at that particular company: does it have something to do with their work culture? Or, perhaps, the work that they do has inspired you? In drafting your application letter, do you best to outline the skills you can bring to the role which highlights your most relevant experience and making sure you include keywords from the job ad. The key here is to sell yourself to them. When you sell a product that you truly believe in, you will have automatically gained the trust of the consumer or client which will make them buy your product. So make sure to write on why you think you truly deserve the job hiring. Recruiters and employers go through hundreds of simple resumes in a single day. So, the ultimate question is: what makes you different from the rest? Do you possess a particular skill set that sets you apart from the herd? What experience do you have that the others do not that will serve useful in the work the company does? Once you have asked yourself these questions, go through your many achievements that you obtained, seminars that you attended, honors that you have earned, training and work experience that you have experienced and list them down respectively. Employers will take notice of it and acknowledge your skills and talents that you have gotten over the years and take that into consideration for your employment. It is important to proofread everything and check as to whether you got the correct spelling of the names and addresses of the employers. Grammar is also a key factor in writing cover letters since it shows how literate you are in the English language. Try to not leave room for errors and grammatical lapses as employers do take the time to check that as well. You may also see baby registry checklist examples. Make sure that you place your contact details in the cover letter or in the resume (whichever you prefer) so that the employer will have a way to contact you should you get the job offer or not. You may be using your old resume with the old contact details so try and update all your contact information beforehand. You may also like blank checklist examples & samples. You cannot just make up any file name as you please. Knowing that you are going to apply for a company, make sure that the file name is proper to allow the employer to immediately recognize which is which. By arranging and categorizing your file names in the proper context, it simply shows how you exercise professionalism. You may also check out quality checklist examples & samples. Double check and make sure that all the requirements are in place. Otherwise, the employers would not even bother to endorse and accept your application. Some employers would require more than just a resume and simple application letter. Go through the employee checklist once again and ensure that all the necessary documents are in tact. Just like choosing which university to go to for college, you can’t only limit your options to just one. It’s important to always keep your options open. You can always try to apply to multiple jobs. In that way, even if you don’t get accepted in Job A or Job B, at least you have some sort of a fallback to turn to which is Job C. In any case that the company fails to contact you, you can always make the first move and call them to follow up on your job application status. By doing so, they would understand and appreciate your initiative and make sure to reply to your application as soon as possible. 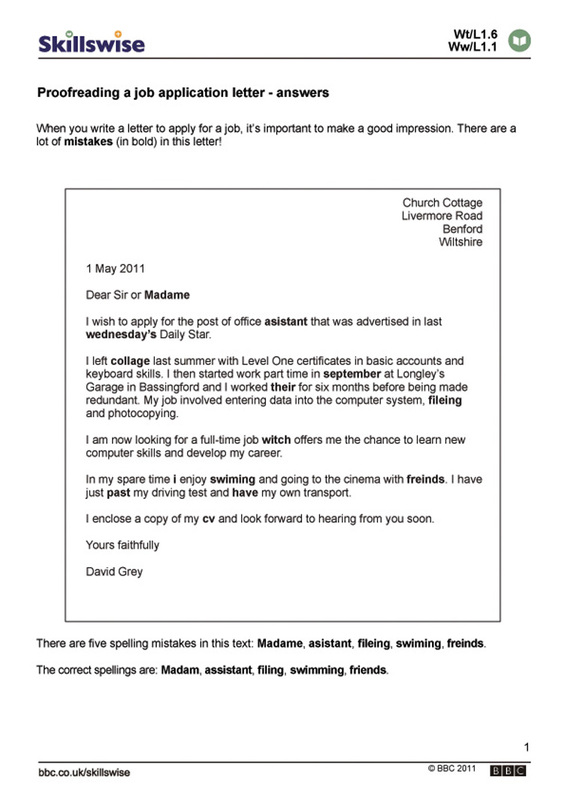 Found below is an example of a student’s application letter for his on-the-job training which is required by the school during the duration of the course. My name is Zack Carlo, a graduating student from the pioneering batch of the Communications program major in Media at Harvard University. In partial fulfillment of my course subject Media Intern 2, I am required to render at least 300 hours in any print media industry for my on-the-job training to provide me with understanding and first-hand experience in my desired field of expertise by the time I step into the real world. In line with this, I would like to apply as an intern for The New York Times. You may also see to do checklist examples. 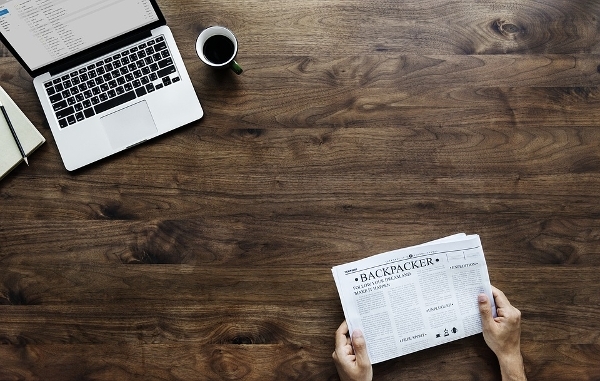 I am interested to work for The New York Times as a news writer preferably in the lifestyle section or in any section in the news beats that you see fit since I have been trained by my respective university and high school professors on how to write different kinds of articles for news. I believe that my internship with The New York Times will allow me to gain first-hand experience on what it takes to become an actual journalist gathering news without supervision. This experience will not only allow me to build my self-confidence especially in asking interviews when gathering the required data, and hone my skills in writing, but will also be more critically in assessing the type of story I should be writing. You may also like maintenance checklist examples & samples. I am free for a personal interview anytime at your convenience. Please notify me through 1234567890 or my personal email noone@randomemail.com. I am looking forward to your positive response. I am Michael Holmes, an incoming Fourth year student taking up Bachelor of Arts in Communication Major in Media in Cambridge University. I am required to undergo an On-the-Job Training (OJT) with a minimum of three hundred hours of media-related duties starting this November 2017. This is in partial fulfillment of the requirements of my chosen degree program. You may also see wedding checklist examples & samples. Through this experience, I will be able to learn the reality behind the world of news writing through the eyes of experienced and notable mentors in your esteemed company. I believe that working with this company will surely provide me with an opportunity to assist in producing news and expand my Media knowledge and skills. You may also like audit checklist examples & samples. I hope to hear from you as soon as possible. Thank you for your consideration. 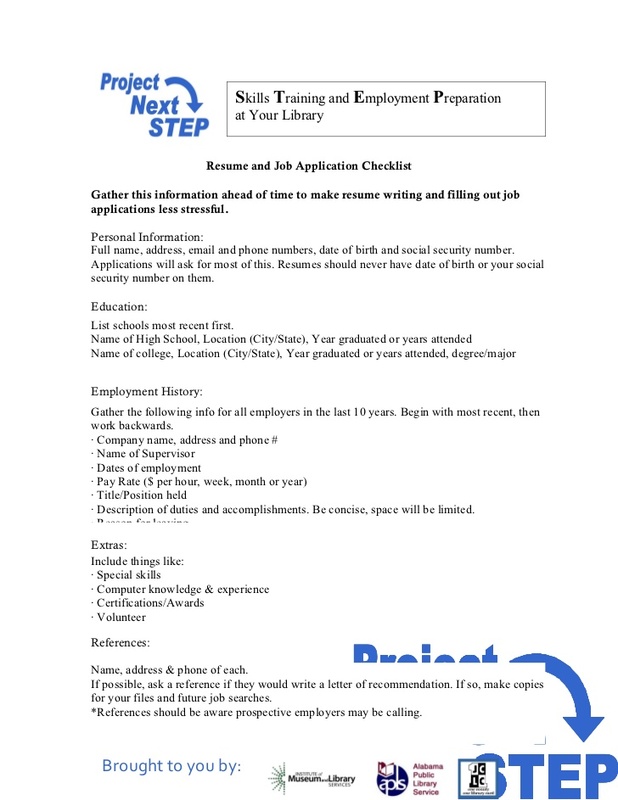 Making a resume does not have to be too complicated. Although there are many parts to it, the main goal of the resume is to simply provide a background of yourself to your employer so that he or she can get a better idea on who you are as an applicant and as to your credentials as to whether you are meant for the job or not. You may also see hr checklist examples & samples. Don’t forget that this is the first major step into the real world– getting both your job application letter and resume right. Once you have those set, all that is left to do is just breathe and be prepared for the job interview.